The 6.5 Inch Component Speaker brings a wonderful music to your room. The exquisitely compact design eliminates the cumbersome features of conventional speakers, allowing you to experience significant sound quality while not paying attention to it. It features an innovative direct/reflective satellite speaker array and a mid-range speaker to produce a realistic 5.1-channel sound field, making music and vocal conversations clear and realistic. The unique low speaker produces pure bass. Two built-in down drivers make the bass more realistic. 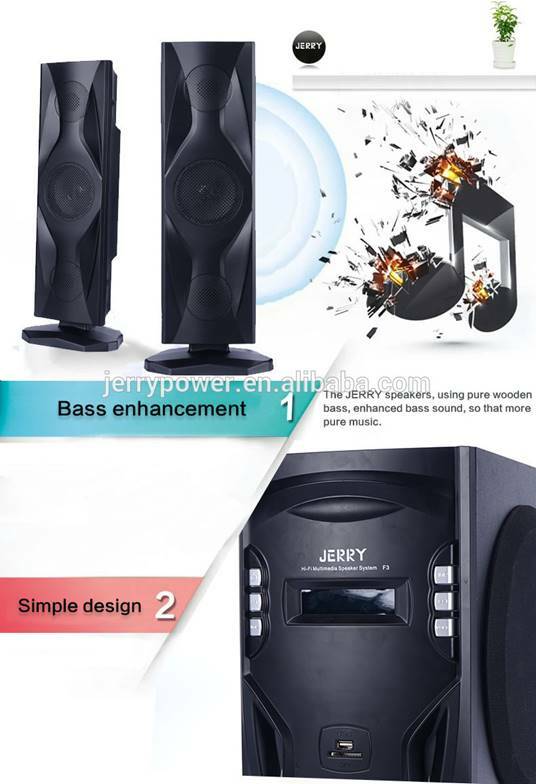 Add surround sound to your home theater setup with this JERRY 3.1 Series speakers system, which includes 4 Direct/Reflecting speakers, a horizontal center-channel speaker and a powered Acoustimass module. 2.Potable storage devices can be directly inserted with MP3 music. 3.SD/MMC card slot support SD/MMC card, so you can read the MP3 format audio file. 4.The bass unit uses a diameter of 6.5 inches speakers making it more outstanding. 5.You are able to connect the 6.5 Inch Component Speaker to your all audil and video equipment, MP3 player, PC, TV, mobile phone, tablet, DVD, CD and other multimedia equipment.